Politics is finally waking up to the reality that our economic model is broken. Across the political spectrum, there is a growing consensus that the economy does not work for the majority of people. At the New Economics Foundation, we have been arguing this for over 30 years. But it took a financial crisis a decade ago to expose the weaknesses of our current economic model and 10 years of pain in its aftermath for the mainstream to catch up. For the first time in modern records, ‘economic growth’ has ceased to deliver a pay rise for many. A decade of wage stagnation has left millions of people squeezed as they struggle to meet the growing cost of every day essentials. Many are having to borrow to get by, with three million households now in severe debt. And at the very time when people needed it the most, traditional sources of support through public services have been cut to the bone in the name of austerity. One in three of our children now live in poverty. Meanwhile, wealth continues to be concentrated at the top: the richest 10% now owning 45% of the country’s wealth, while the poorest half of households own just 9%. It is no surprise that people up and down the country are angry and frustrated about an economic system that has failed them. For many, the referendum on our membership of the European Union was an outlet for this discontent – and the result a demand for change. But if the last two years are anything to go by, Brexit will make it harder, not easier, to achieve this change. The political class consumed with the ins and outs of exiting Europe will continue to have limited bandwidth to take on the bigger, more important challenge of transforming the economy. And when Brexit fails to deliver the pace of change that people want, the build-up of rancour will grow and the clamour for change will get louder. This will create an urgency and political imperative for parties across the spectrum to respond. Any response from progressives must start with a recognition that the four-decade-old neoliberal model is exhausted. We need a new economic model – one that works for people and our planet. The new economy must be rooted in a thriving and healthy environment, in which a green transition is seen as the priority because climate change and the damage to our environment is now the biggest threat to economic justice we face. It must deliver better and more equal living standards in which the basics for a decent quality of life – minimum income, housing, health & social care, childcare and education – are guaranteed for all and provided communally. It must be built by businesses that work for the long term and in the public interest with stronger voice and power for workers baked into their business model. But perhaps above all, it must be an economy that genuinely empowers people. By giving people greater ownership and stake in the economy through common ownership of public goods and essential infrastructure and co-operative and mutual ownership of enterprise. It must be supported and stewarded by an active but decentralised state rooted in communities and shaped by strong democratic participation. Finally, it must push power and decision-making down to communities where people know best, enabling them to act collectively to improve their lives. Getting here will require us to radically change the rules that govern the way our economy is run. The question is whether any governing party will be willing to take this on. Labour shows signs of promise with its commitment to radical economic reform and its recent policy announcements on employee ownership, ownership of essential utilities and zero carbon emissions by 2050. But it has some way to go to reimagine an economy that is not dependent on a central state ‘doing change’ to people from the top. The Conservatives have embraced the principle – if not the practice – of decentralisation and empowering communities, but have yet to set out a compelling economic response that offers an alternative. Both parties will come under increasing pressure in the coming years to put a coherent agenda for change to an electorate fed up with the status quo and disappointed with the inevitable outcome of Brexit. The political cost of not doing so will be immense. But the new economy won’t just come from changing the economic model or implementing different policies from the top. It will be created by those at the sharp end of the economy having an effective voice and role in how it is run. Up and down the country, people are already taking the lead in putting the new economy into practice – using their frustration with the status quo to fashion different ways of doing things. This growing movement of people represents millions of every day activists fighting for change in their communities, businesses and workplaces. By tapping into their energy and thirst for change, we can begin to forge a path to an alternative. And perhaps create the backbone for a renewed progressive politics united by a common cause to build an economy for the people, by the people. 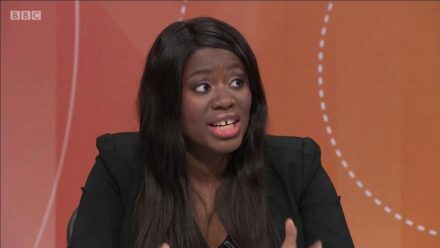 Miatta Fahnbulleh is chief executive of the New Economics Foundation and will be a speaker at the FEPS-Fabian New Year Conference: Brexit and Beyond on 19th January 2019. Miatta Fahnbulleh is chief executive at the New Economics Foundation.